O Wind, Take Me To My Country by Jess X. Snow. Kingston, NY, ft. Safia Elhillo. Photo by Jess X Snow. Jess X Snow (@jessxsnow), the author of this post, is an artist, filmmaker and Pushcart-nominated poet. 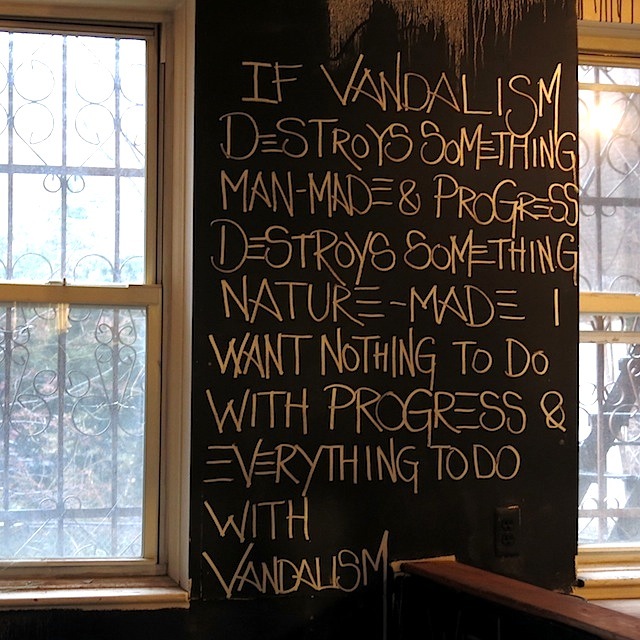 At its worst, public art can be imagery that heightens already existing social hierarchies and inequalities, and at its best–can be a portal into a future of healing and transformation. I am a queer Asian American immigrant woman and non-citizen to this country. I grew up with a speech impediment so severe it caused me to fear my own voice. When my speaking voice failed, I fashioned myself a new one on the blank page. 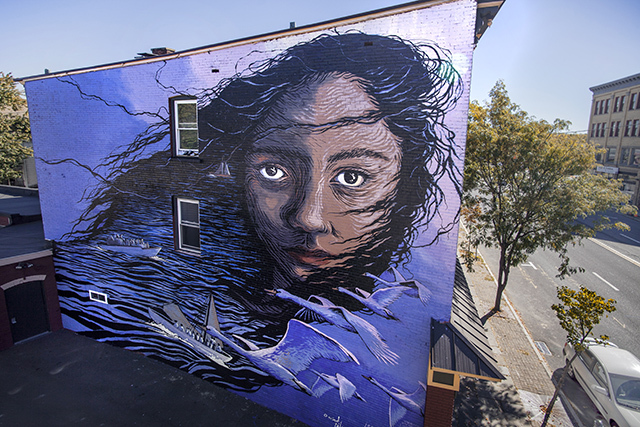 I became a muralist because public art became the closest thing to a voice after a lifetime of feeling silenced. 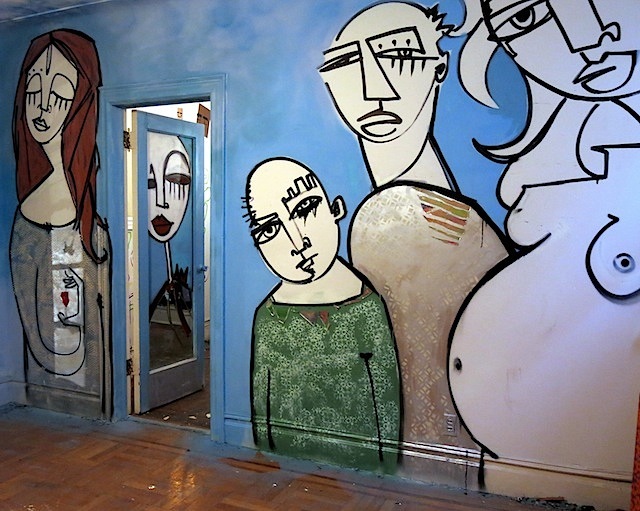 When I started painting murals, I was both exhilarated to make work on such a large level and immobilized by a fear of taking up public space. Where did this fear come from? For my childhood, every time I stuttered, my classmates finished my sentences for me. As I grew up, I experienced gender and racially-exoticizing harassment just walking down the street. As a woman of color working in film and public art, the icons I have to look up to are few and far between. As a migrant, I grew up watching my mother get denied at the U.S. border, homeland security giving her trouble every time she renewed her visa, up until we finally obtained our green cards after nine years. 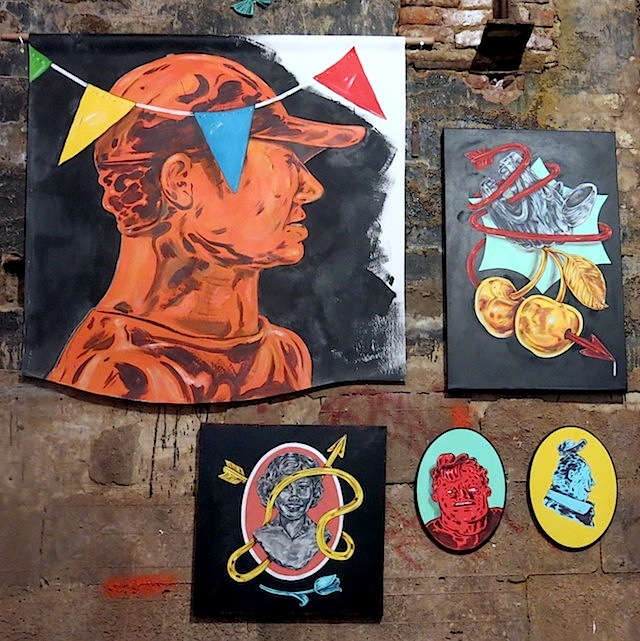 In all this, the ability to survive as an artist, and live here legally, comes at so high of a cost that the idea of doing illegal art, or physically taking up public space, can feel life-endangering. The exhibit continues through this week at 270 Meserole Street in Bushwick; check the Exit Room NY Facebook page for hours. 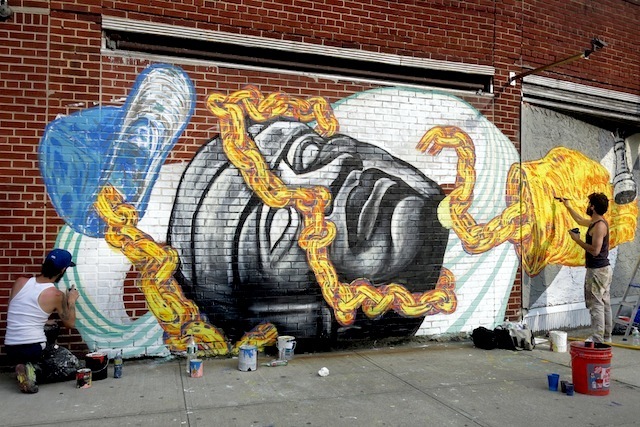 Mata Ruda’s piece on Broadway. Photo courtesy of Wall Hunters. 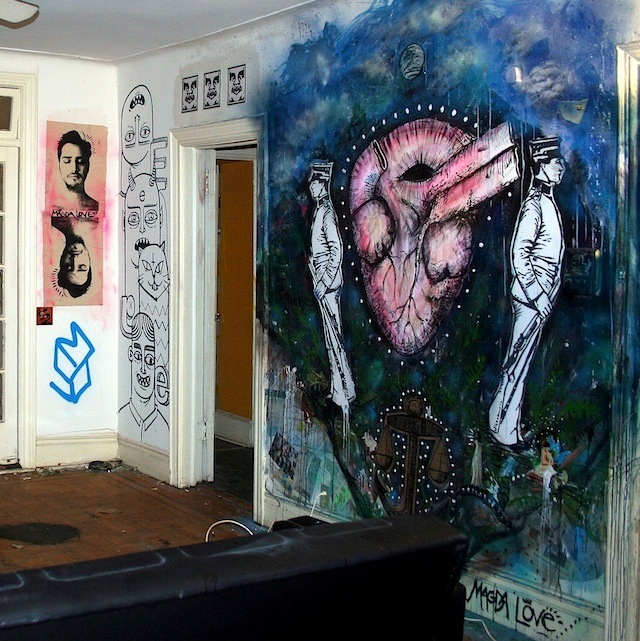 Wall Hunters‘ “Slumlord Project” was a project that installed 17 pieces on dilapidated vacant houses that are owned by people we consider to be negligent property owners. 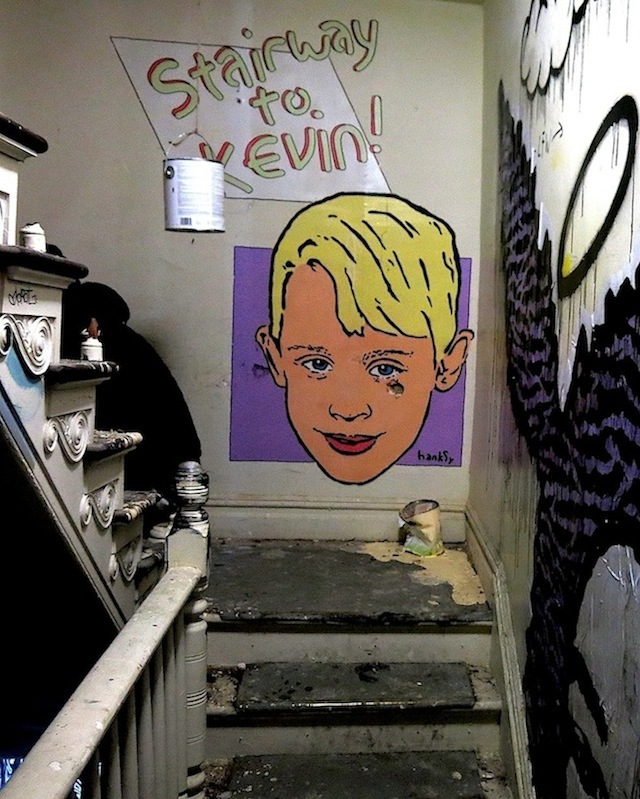 The project was a collaborative venture between the newly-minted street artists’ nonprofit, Wall Hunters, and Slumlord Watch, a local blog that documents the city’s shameful and shockingly large stock of uninhabitable vacant homes. QR codes and text descriptions were pasted alongside the art. A cell phone app scan of these instantly unveiled ownership information on the guilty landowner by linking to the Baltimore Slumlord Watch website. The artists’ ephemeral work and the community reaction to it was recorded for a documentary being produced by the project’s third partners, filmmakers Tarek Turkey and Julia Pitch. The project’s goal was to catalyze a larger conversation on Baltimore’s vacancy issue–a conversation that includes the normally muted voices of those who live in the targeted neighborhoods, as well as politicians and the developers whose phone calls get answered by city hall. The idea for the project was born about a year ago. 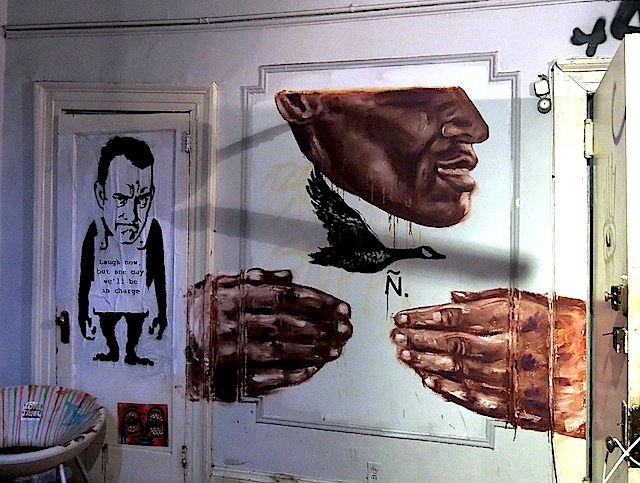 At that time I was putting up wheatpastes on dilapidated, vacant houses. As I was researching specific properties I was hitting, I regularly came across the Baltimore Slumlord Watch blog run by the housing activist Carol Ott. Slumlord Watch is basically Wiki-leaks for Baltimore’s underfunded housing authority. As blog posts make clear, many of the blighted houses are owned by entities with the means to fix their crumbling properties–slumlords who blithely ignore the cost of their neglect on city communities. 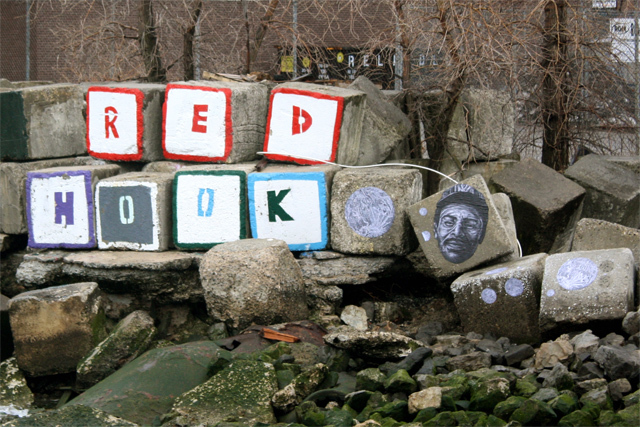 Since much of my work uses images to deal with the vacancy problem and Carol was battling the same issue, we decided to meet and try to do something that joined street art with housing activism. I began driving her around while she catalogued vacants and researched ownership, and I wheatpasted. Caleb Neelon & Katie Yamasaki. Photo by Lois Stavsky. Queen Andrea. Photo Lois Stavsky. 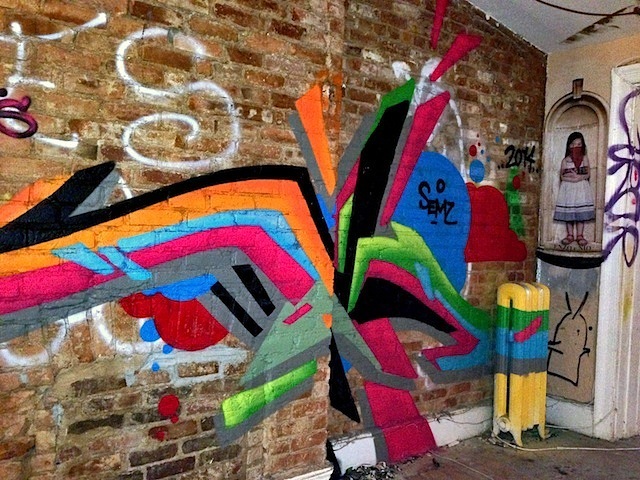 Veng at work on collaborative mural with Chris, RWK. Photo by Tara Murray. Kimyon Huggins. Photo by Lois Stavsky. Kosbe. Photo by Tara Murray. JC. Photo by Lois Stavsky. Mata Ruda & ND’A. Photo by Lois Stavsky. 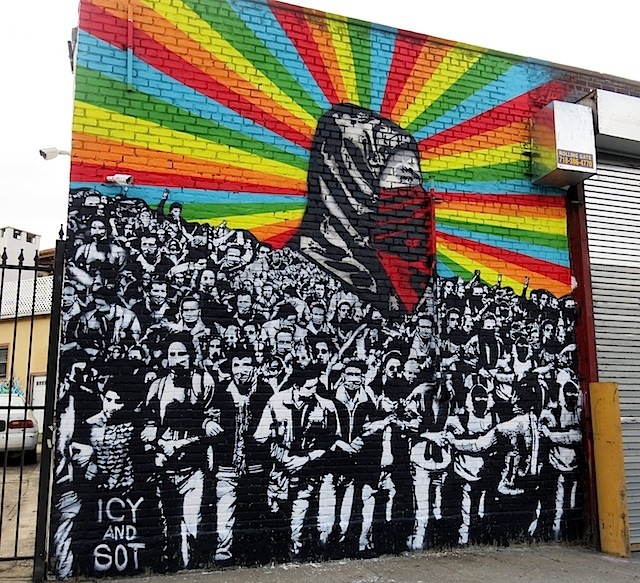 Icy & Sot. Photo by Lois Stavsky. El Kamino. Photo by Lois Stavsky. 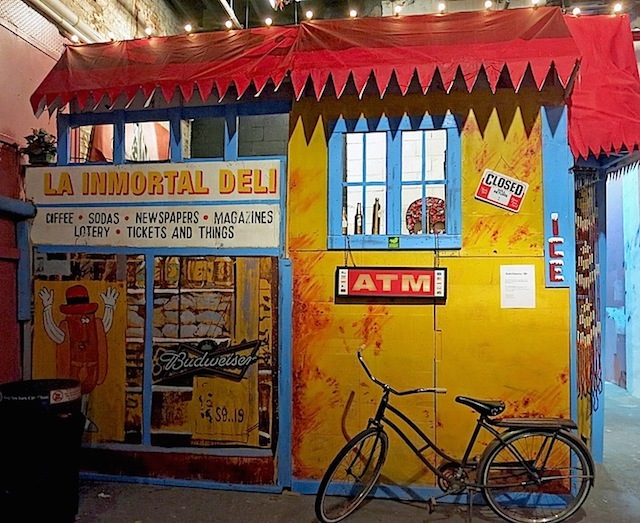 If you are anywhere near NYC, a visit to Welling Court is a must! The diversity of the works and the responses of the local residents to them are astounding. And if you’d like to help fund this project, check this out. 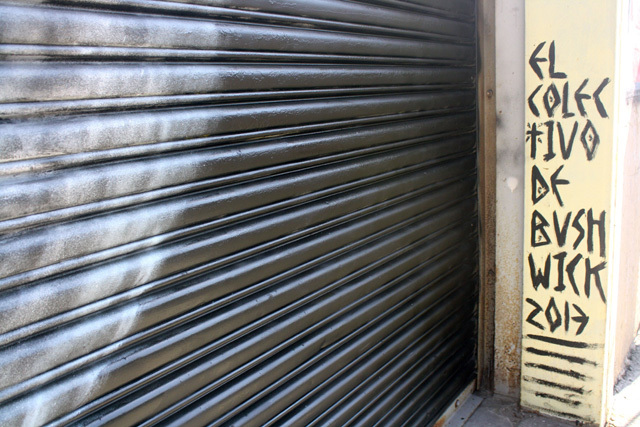 One of the most pivotal aspects of street art is the democratization of public space. 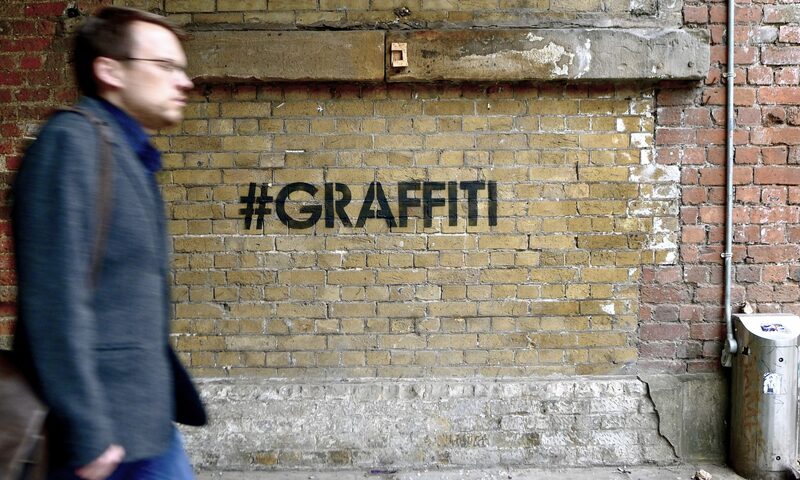 Whether people choose to engage or not, graffiti and street art are a way of reminding the everyday pedestrian that they have the power to manipulate their environment (sometimes at a price). Many residents of Balitmore have had to accept dilapidated neighborhoods as their everyday quality of life. The structures around them are literally falling apart due to neglect from city government property owners and has resulted in a massive property-vacancy problem. If Broken Window Theory has anything to do with it, that “If the city doesn’t care, why should I?” mentality has fostered one of the highest crime rates for any city in the country. 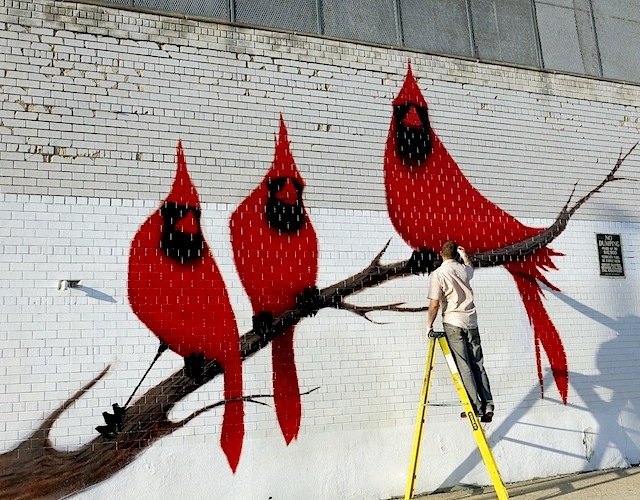 What does street art have to do with Baltimore’s structural issues and decline in living standards? 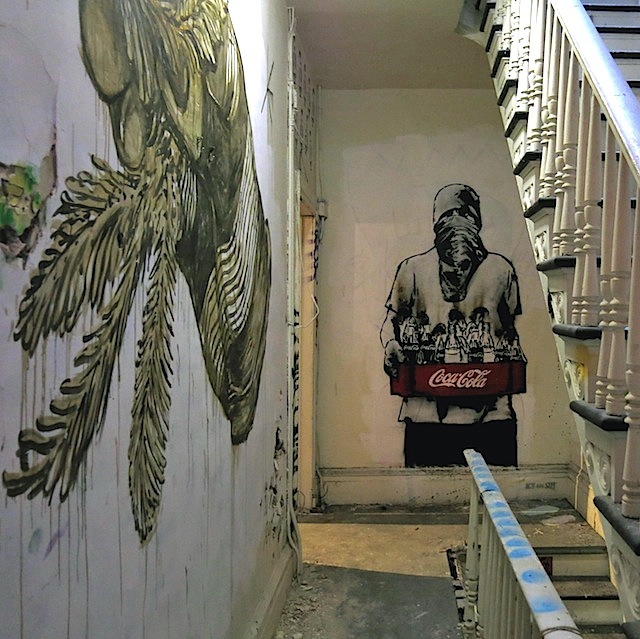 Over a dozen street artists have taken on the task of bringing attention to these issues in a grassroots effort, through installing large pieces on some of the city’s dilapidated, vacant houses. Nether, Gaia, LNY, Noh J Coely, Mata Ruda, Nanook, Harlequinade and others have joined their forces as a non-profit organization called Wall Hunters have teamed up with Baltimore Slumlord Watch to put up large-scale murals on these eye-sore structures with QR codes alongside which informs viewers of who owns the vacant property. Simultaneously, they are creating a documentary with Nether and Carol Ott at the forefront, showing this massive issue corroding Baltimore and their relatively small effort to combat it. They’ve received a bit of funding to make their project possible but not enough, so they’ve created this Indiegogo campaign to bring it to fruition. 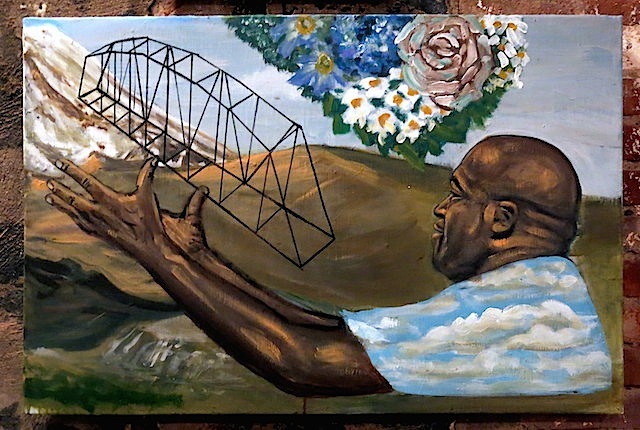 Mata Ruda’s portraits exude a distinct soulful beauty that splendidly captures the essence of the immigrants and other outsiders that speak to him. 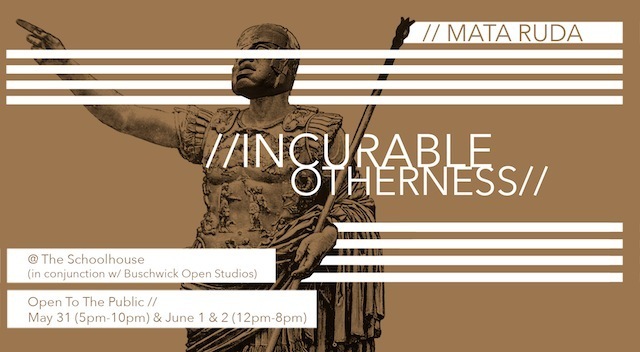 Mata Ruda’s first solo exhibit, “Incurable Otherness,” in conjunction with Bushwick Open Studios, provides us with an intimate look into the artist’s sensibility and aesthetic. 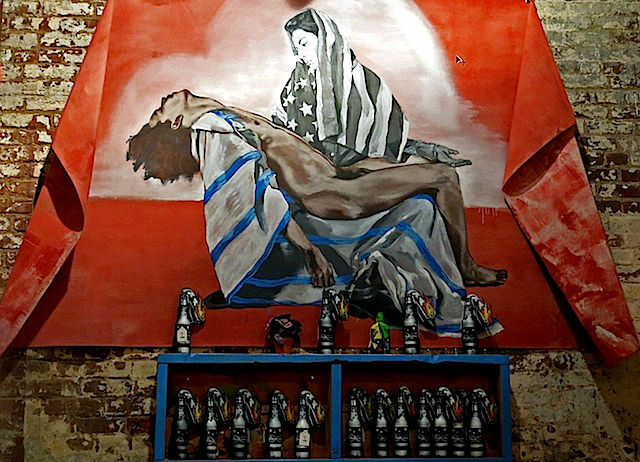 This exhibit is open to the public this weekend at The Schoolhouse at 330 Ellery Avenue in Bushwick. The turn of the century site of Public School 52, The Schoolhouse is the perfect setting. 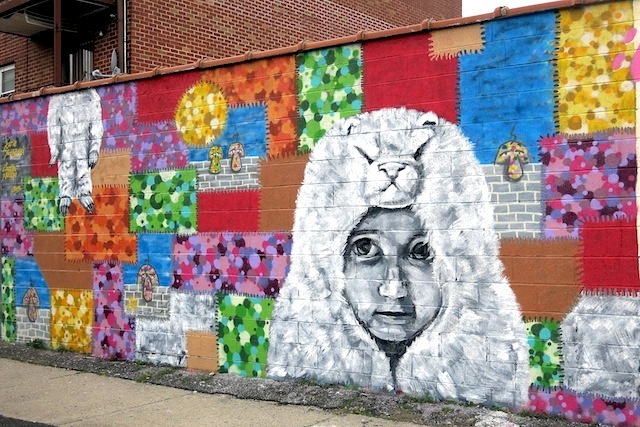 Gaia, Nanook, Mata Ruda and LNY are trying to raise some money on Kickstarter to paint some arabber stables in Baltimore. Arabbers are fruit venders who sell fruit on the street from horse-drawn carts. Gaia already painted one mural at their stable last summer. 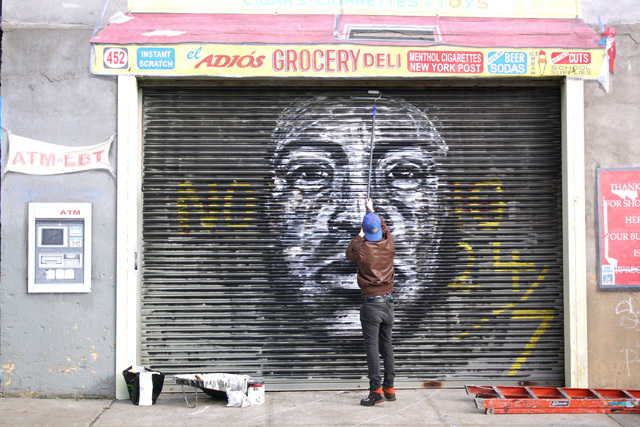 These four artists are all known as talented muralists, but they also do great sketches. Which is lucky because funders of the project can get some very affordable sketches for helping out. 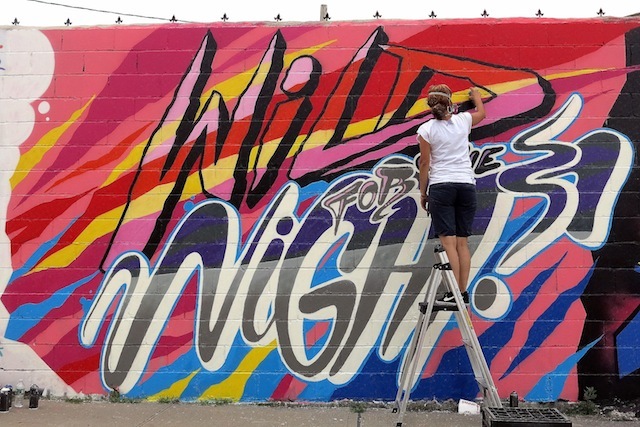 Check out more about the mural project here. 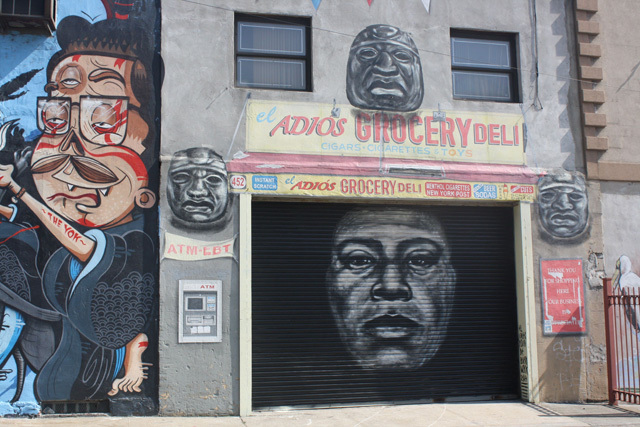 Note: This article is the first in a three part series that discusses how three artists dealt with the topic of histories within their Bushwick Collective murals. 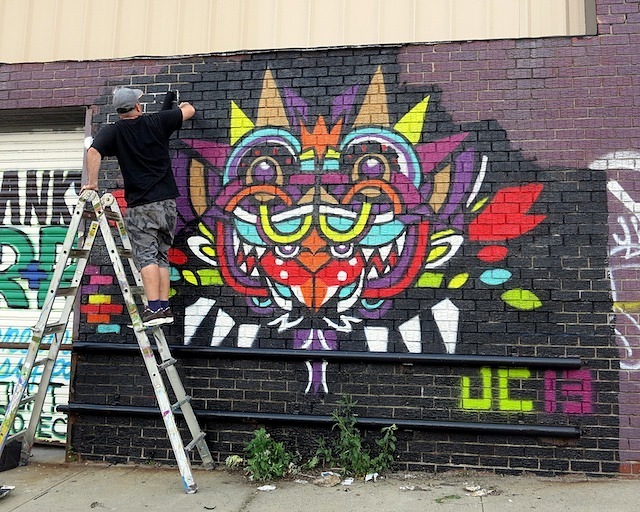 Originally from Venezuela, Mata Ruda drew upon the history of Central America for his first wall in New York City at the Bushwick Collective. 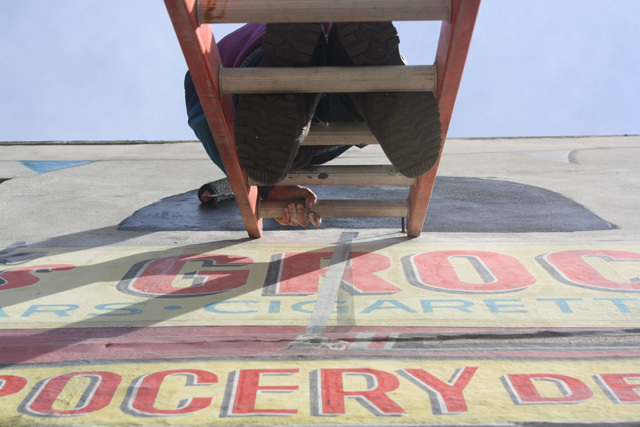 Inscribing his images upon the preexisting mural by fellow Open Walls artist Gabriel Specter, the artist combines the context of Specter’s poppy “El Adiós Grocery” with his monochromatic imagery. 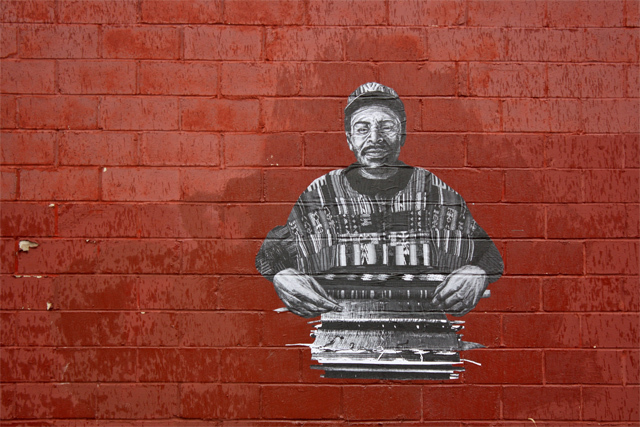 Using a source photograph of an unknown, undocumented immigrant, this anonymous voice is given an ominous presence within this space. In a city of immigrants, the face of this everyman is accompanied by signage for a store that could exist on any corner in the city, asking us to question our interactions with people and iconography that most New Yorkers would not give a second thought. Combined with the black and white central portrait are a series of masks that float ominously around him, looming over the grocery’s banner. One of the first Mexican civilizations, the Olmecs were a Mesoamerican culture that now only exists through and is represented by the objects they left behind. 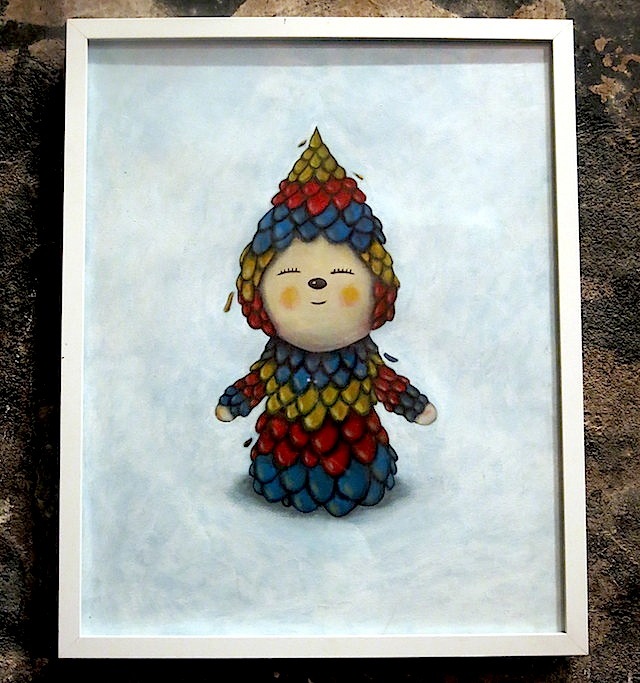 The defined faces and hollow eyes of these artifacts have become emblematic of the culture, often called “colossal heads.” By applying traditional imagery from the contemporary figure’s transplanted homeland, Mata Ruda links the importance of a person’s past in their present through the use of historical imagery. The Olmec expression is echoed by the undocumented immigrant, further underlining this message. 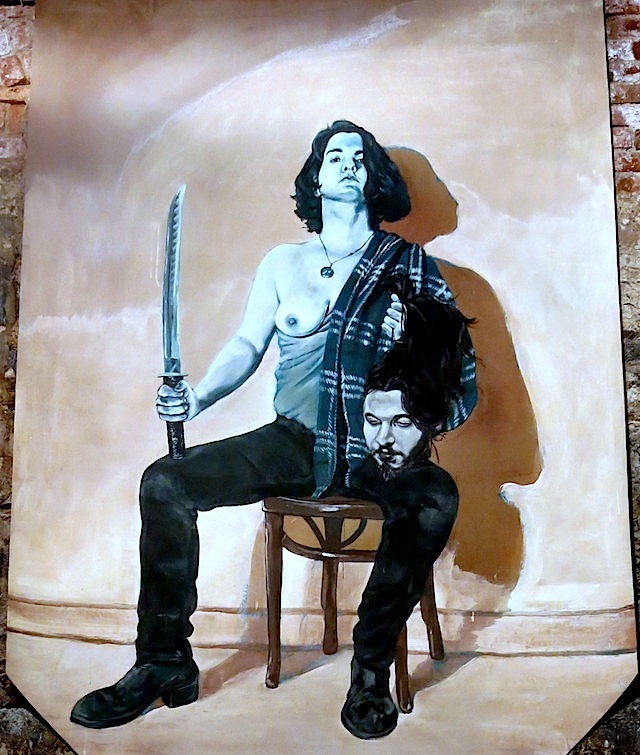 Conceptually and visually intricate, Mata Ruda‘s portraits convey a history that is unfamiliar to those who remain unaffected in their daily lives. 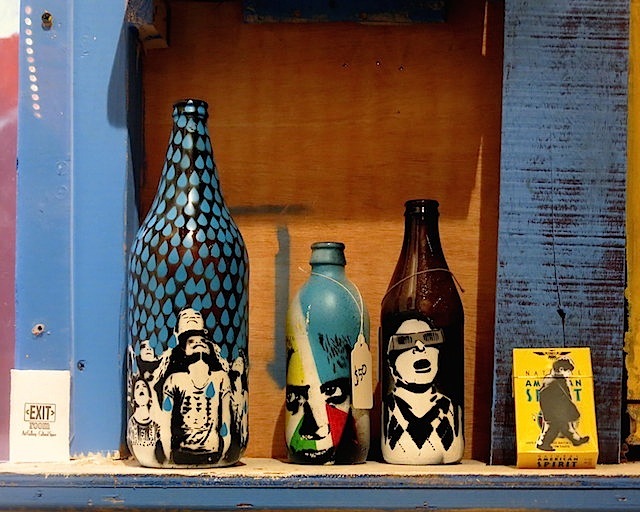 The idea of el otro, or the other, is something that permeates not only methodologies behind Latin American art history, but the lives of those who chose to emigrate from those countries. While the translation is literal, the word otro encompasses more than that; it’s the feeling of being pushed to the side by the government and others because of one’s origins. Whether undocumented, displaced, or otherwise without a home, these individuals are often left without a voice. Director Alejandro González Iñárritu explains the feeling of otherness as, “we can’t understand what is happening to ‘something’ if we aren’t looking but nothing is going to happen to that ‘something’ if we don’t look deeply. 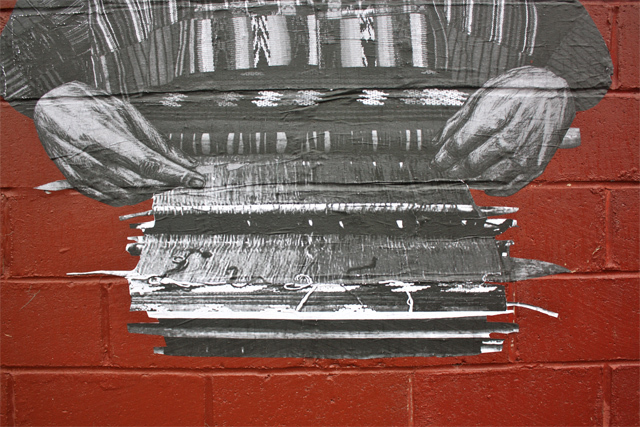 That’s why so many things with incredible potential go unnoticed…..because nobody bothers to look.” In his most recent series, Mata Ruda draws attention to artisans who would otherwise go unnoticed, traditional Central American weavers who have since emigrated to Brooklyn. 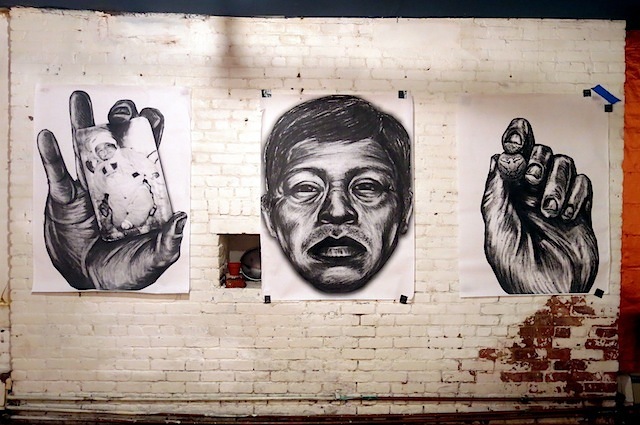 By immortalizing these individuals in a public space, the artist draws attention to several underlying issues, such as our lack of appreciation for craftwork, immigration, and labor standards. Often seen as less than art because of its functionality, this portrait draws attention to the technical layers that makes up the complex patterns associated with Central American textiles. In order to create the zig-zags and vertical stripes associated with these patterns, you must be proficient enough to operate several huddles as well as have mathematical precision in order to accurately reproduce a specific image. This same attention to detail can also be seen in the detailed lines that form the shadows and creases of the weaver’s hands. While the right hand is busy manually picking the weft to create a pattern while the left tests the warp’s strength. 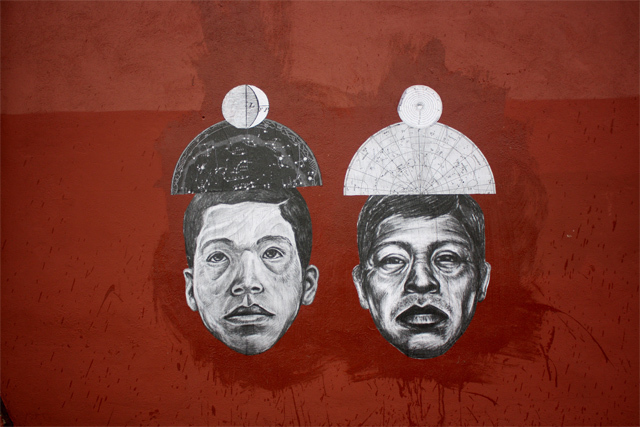 It is in this intricate representation of the forgotten that Mata Ruda can be compared to other Social Realist public artists such as Gaia and muralist José Clemente Orozco. During his life, Orozco saw his neighbors used as expendable bodies in the Mexican Revolution, which he envisioned in The Masses as a sea of faceless heads, yelling but not thinking. The harsh lines that define a field of overlapping reflect the hoards that barricaded towns into starvation during his childhood and eventually led to the loss of one of his hands. For Orozco, he called upon these experiences to give a voice that would otherwise be lost with the pulling of a trigger. A hundred years after the war’s inception, Mata Ruda follows in a similar path, but instead representing the inequalities that run through the 21st century. 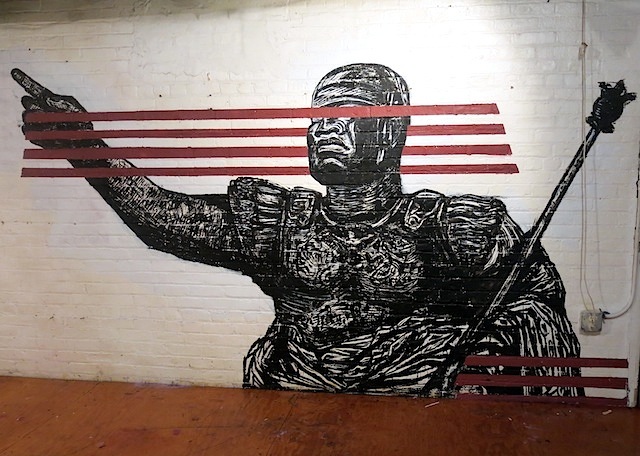 Equally as important for Mata Ruda is the representation of homeland and histories. Visually, the artist draws upon the mythology of lunar planning that was integral to his predecessors. 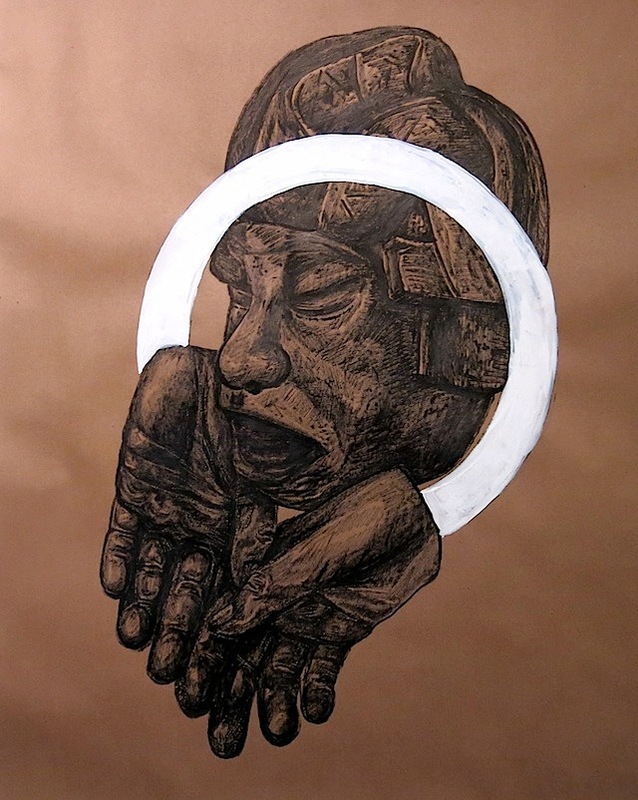 Used as a planning tool for practical matters and spiritual ceremonies, Mata Ruda has created portraits that symbolize this importance; the lunar calendars orbit his figure’s head on a series of rocks or become literally placed on their conscience. It was not enough for the artist to display this meaning in a public space, he also took on a name that would convey this symbology. When literally translated, Mata Ruda means a rough or hardy plant, one that can survive when transplanted like the emigrants he depicts. Beyond the translation, the latter part of his name can be seen as a corruption of the spiritually vital herb Rue. As with lunar charts, this herb is used for its supposed spiritual properties, such as warding off evil and to bring abundance. Through his use of subjects and histories that would otherwise be forgotten, Mata Ruda can be seen as an embodiment of his chosen name. 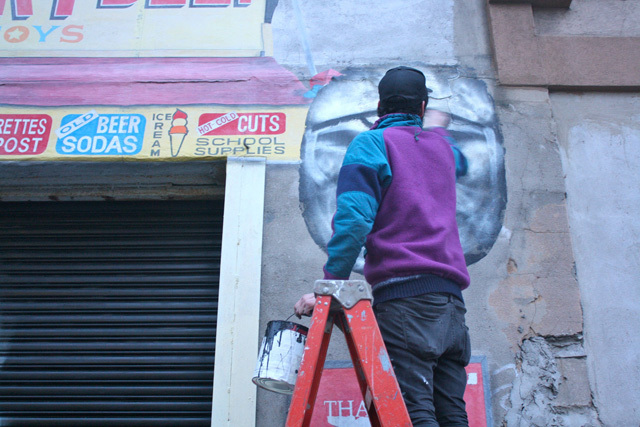 Although paper and wheatpaste may not weather storms, the ideas behind them will last.